Yes, but most clients don't feel the need to wear eye makeup... Wake up and go! No more running, streaking, smidging, or flaking mascera. You can still apply eyeliner and eye shadows as usual, as long as it is not waterproof or liquid, as these products will break down the adhesive. WILL EXTENSIONS DAMAGE MY NATURAL EYELASHES? No. Our mission is to select the proper weight and langth so you may wear your extensions indefinitely. 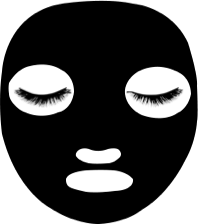 The health of your natural lashes is our top priority. We will never apply long or heavy extensions causing damage to your natural lashes. We recommend getting a touch up every 4 weeks. A touch up is needed to fill in any lashes that have fallen off. Touch ups average about 45 minutes. Yes, even though mascara is not really required since the extensions actually give the illusion of wearing mascara, it can be worn. DO NOT USE OIL-BASED OR WATERPROOF MASCARA.